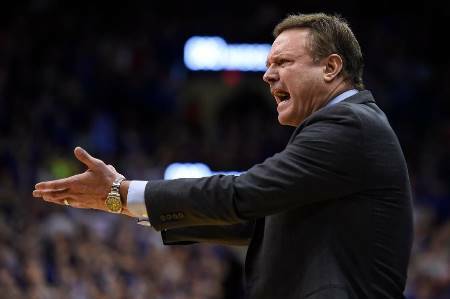 February 8, 2019 By David A.
Kansas’ quest to win its 15th straight Big 12 basketball title took a big hit on Thursday night. The school announced that Lagerald Vick, a senior guard, would be taking a leave of absence, effective immediately. Coach Bill Self said on Thursday that Lagerald Vick has personal issues and will leave the team for a period. During the time Vick is gone we will respect the right to Lagerald’s privacy, added Self. The coach told the media no timetable exists for Vick’s return. La La Vick, Lagerald’s mother, told a local newspaper that she wanted her son home in Memphis, Tennessee. She said the family needed him with them for a couple of weeks as much is going on and she needed him. On Tuesday, in a loss by Kansas to Kansas State Vick played just 19 minutes, which is his season low, scoring only seven points. The scoring performance of the 6-foot-5 Vick has trended downward since the beginning of the season. In November, during a stretch of five games strong games, Vick was averaging 24.6 points per game and scored 29 versus Villanova in December, but since that time Vick has scored as many as 15 points only twice. This season, Vick is averaging 14.1 points but is shooting 45.1% from beyond the 3-point arc. In the six losses Kansas has had this season, Vick’s has averaged just 10 points per game. Vick declared for the NBA draft after Kansas’ run to the Final Four last season, but Vick withdrew from the draft at the last minute and returned for his final season in Kansas. Kansas is hoping to win its 15th straight regular season Big 12 title, but is in fourth place and needs to turn things around quickly.